(Gainesville, Florida) – What does an insurance provider do to insure the continued comfort of their own staff? 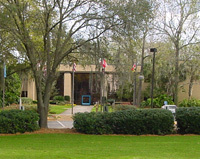 For Nationwide, one of the largest insurance and financial service providers in the United States, the answer was a facility upgrade, adding to their offices in Gainesville, Florida. Nationwide completed its 35,000 square foot expansion last September. The facility now totals nearly 200,000 square feet. The promise of reduced energy costs and better control of the HVAC system through automation prompted the facility upgrade. Due to a long and healthy relationship, Nationwide chose the local KMC representative, W.W. Gay Mechanical, as the contractor for the project. Gay Mechanical has been the service provider for this facility for the last 15 years and is noted for high-quality service. The recently completed building project included a complete upgrade of the partially pneumatic and partially DDC system. During the systems upgrade, management determined that the main AC unit should be updated to a new chiller. System upgrades also included installation of 230 VAV controllers, VAV boxes with reheat coils, and two LAN Controllers. These Tier and Tier 2 products from KMC provide a reliable peer-to-peer network of control. The project resulted in a fully integrated HVAC system, controlled from a central PC using the latest version of the KMC WinControl program. With this success now behind them, Nationwide now plans on an integration of lighting and occupancy sensors. And, of course, KMC Controls and Gay Mechanical will insure continued success through this and future projects.